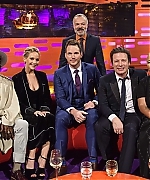 Jennifer Lawrence went about kissing Chris Pratt onscreen in Passengers a little differently than when she locked lips with Liam Hemsworth and Josh Hutcherson while filming The Hunger Games movies. Pratt and Lawrence appear on the Friday episode of the U.K. talk show, The Graham Norton Show, and the Oscar winner opens up about the steps she now takes to make sure her breath is OK when she’s shooting a kissing scene. Passengers, which hits theaters Dec. 21, is set in a spacecraft that is traveling to a distant colony planet and transporting thousands of people, but has a malfunction in its sleep chambers. As a result, two passengers (Pratt and Lawrence) are awakened 90 years early, and strike up a romance. Her latest film Passengers is a sci-fi thriller set in space. And Jennifer Lawrence, 26, looked out of this world when she attended a photocall for the film at Hotel Adlon in Berlin on Friday. The Hollywood star showed off her cleavage in stunning black and white polka dot co-ords as well as a peak at her toned tum. Her cropped bandeau top had a small cutout section to draw attention to her chest, while the elasticated high-waisted skirt emphasised her tiny middle.She wore her long golden tresses in waves from a middle parting and decorated her eyes with thick eyeliner and smokey shadow. Jennifer was joined by her co-star Chris Pratt, 37, who looked dapper in an all-black ensemble. The pair stood side by side in front of the promo board and traded friendly glances. Talk about one stylish #GirlBoss.Jennifer Lawrence attended a photocall today for her upcoming film Passengers in Madrid, Spain, and she managed to make a skirt suit look oh so cool. For the occasion, the Oscar-winning actress wowed in a tailored white blazer and matching skirt that she paired with a chic black top. But her suit wasn’t all business. The sleek mini hit several inches above the knee and highlighted her mile-long legs. The blonde beauty paired the outfit with a surprising pair of kicks—platform sandals that featured a dazzling bejeweled buckle and vibrant print. She accessorized with an assortment of delicate jewelry that included a Randall Scott Fine Jewelry Ring. To complete her winning look, she styled her long strands in loose waves and rocked a dark smoky eye. The 26-year-old’s co-star Chris Pratt was also present at the event, and the two were snapped goofing off and laughing together as they posed for photos on the red carpet. Thanks to Mouza for donating the Chris/Jennifer pics to this site <3 Go visit her site for Chris Pratt. The latest trailer for sci-fi blockbuster Passengers shows Jennifer Lawrence and Chris Pratt getting hot and steamy in a huge spaceship. 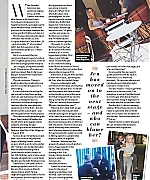 And the thriller’s two leading stars put on another close display, albeit a more professional one, at a photocall for the flick inside Hotel George V, Paris, on Tuesday. American beauty Jennifer, 26, covered up in a knitted jumper emblazoned with a large star on the chest and a floor-length semi-sheer skirt. The actress’s slender pins were visible through the netted material. Underneath the item, which was adorned with golden bees, she wore a pair of pale blue hotpants. She tied her blonde tresses up, with some loose tendrils framing her face from a middle parting. Jennifer’s complexion looked flawless and healthy, and the American Hustle star covered her lips with a deep pink shade, while her blue peepers were decorated with lashings of mascara. Read more at Vanity Fair.com and check out the magazine cover and the shoot in the gallery by following the links below. 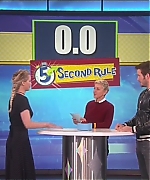 I finally added screencaps of Jennifers appearance at The Ellen DeGeneres Show in Burbank, on November 10th. Enjoy. I am working behind the scenes to cap the appearance of Chris and Jennifer at the Ellen Degeneres show, on November 10th. For now, enjoy the stills. 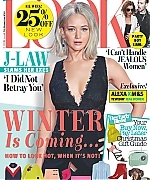 I added scans of Jennifer on the cover of Look UK, the issue from November 7th. No one wants to pit two powerful women against each other, but that’s kind of what will inevitably happen soon between these two A-listers. Leading ladies Scarlett Johansson and Jennifer Lawrence will be thrown into an involuntary comparison battle in the near future, as the two stars are each slated to portray the late Zelda Fitzgerald in dueling biopics. The Jazz Age icon and wife of author F. Scott Fitzgerald died nearly 70 years ago in a fire at a North Carolina hospital, but her life has been at the forefront of Hollywood’s inspiration as of late. Just as Amazon rolls out its own series, Z: The Beginning of Everything, with Christina Ricci playing the “first American flapper,” films starring Johansson and Lawrence, respectively, are said to be on the fast-track to hitting the big screen. The films are said to dive into Fitzgerald’s personal life, portraying parts of her livelihood that may have been glazed over through history. Along with being a literary muse to her famous husband, she was an author herself, and struggled with her own madness (she was diagnosed with schizophrenia and institutionalized). Lawrence’s project, called Zelda, is being spearheaded by renowned director Ron Howard. 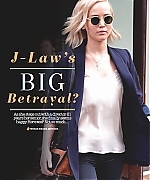 J.Law will also be reconnected with Hunger Games executive Allison Shearmur, who is producing. Emma Frost (The White Queen) wrote the screenplay, which is inspired by Nancy Milford’s best-selling biography of the same name. Meanwhile, Johansson’s film is titled The Beautiful and the Damned, and is based on the F. Scott Fitzgerald classic of the same name, which illustrated the dynamics of his marriage to Zelda. The project has yet to snag a director, however, it does have one secret weapon up its sleeve. While the premise of each film has been disclosed, production dates and slated release dates have yet to be determined. Jennifer Lawrence has proved, once again, why she’s a red carpet style staple. 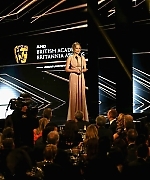 The actress looked stunning in a curve hugging gown at the British Academy Britannia Awards at the Beverly Hilton in Los Angeles on Friday. Lawrence, 26, donned a blush colored dress from Elie Saab’s Spring/Summer 2017 collection, and cinched in her waist with a light pink belt. We have two brand new layouts up, which were made by Claudia from Never Enough Designs. She used a few Dior sets for the layout, which you can find here and here. Check back in a few minutes for more updates about Jennifer.